BoatVAN is boat license free! 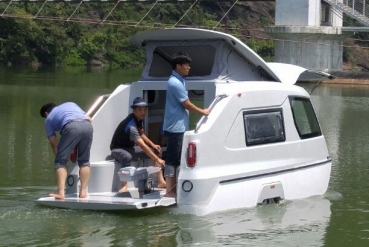 It is a caravan and boat in one. This combination of caravan and boat offers you the best of both worlds in an attractive package. The "BoatVan" allows you a mini-caravan tour on weekends and offers the possibility to ride on the water while still bathing. It is also a perfect solution for anglers. The motorized BoatVan is designed for the calm waters with stagnant water. The bathing platform is covered with teak wood and offers you more space and comfort at the rear when open. Two double benches for 4 people can be converted into a large bed for 2-4 people. Optionally, "BoatVan" can be equipped with a photovoltaic system. Inverter 220V AC, 12V DC, battery 100 Ah, USB, charge controller CTEK (Sweden) for shore supply. Price: 2.298, - € incl. 19% VAT.